Rain until this evening and windy until this afternoon. 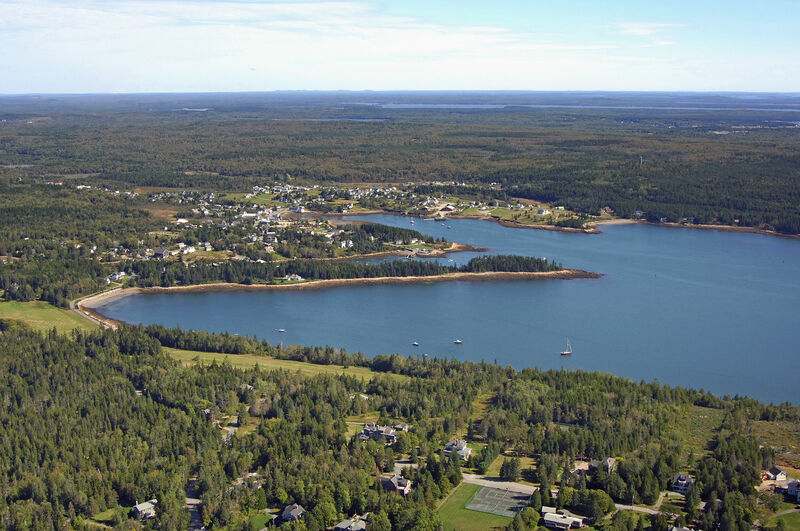 Winter Harbor is located on the upper Maine Coast just north of the Schoodic Peninsula. 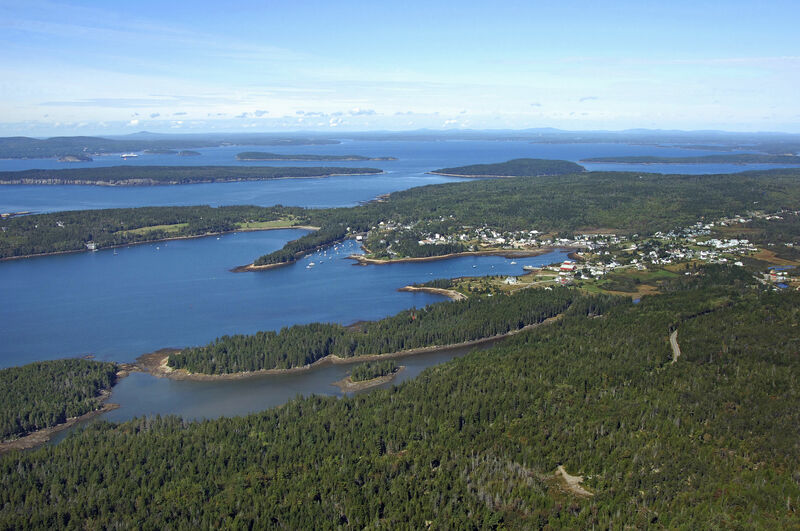 Geographically speaking, Winter Harbor is five miles east of Mount Desert Island and 24 miles west of Great Wass Island. The image above is a view from the south looking north over Winter Harbor where it empties into the Atlantic Ocean/Frenchmans Bay. Off to the right (east) is the Schoodic Peninsula, while in the far center left portion of the image are small Mark and Ned islands. 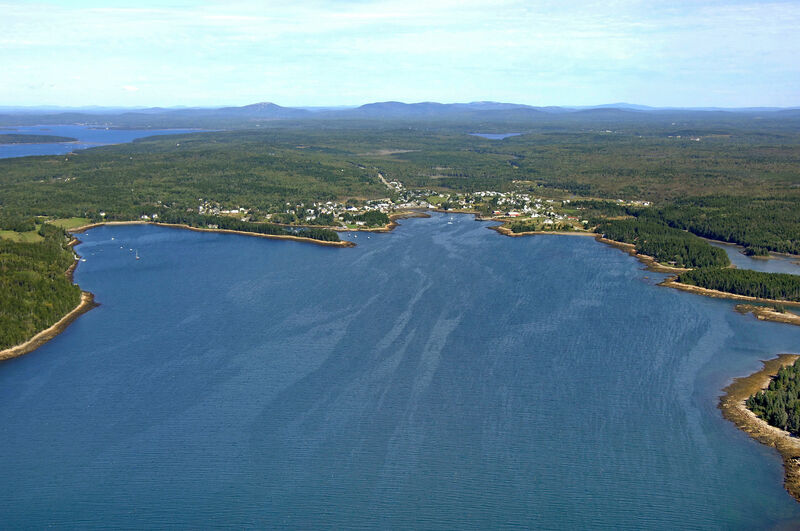 Farther up in the top center part of the image, the town of Winter Harbor can be seen as white specks dotting the otherwise lush green landscape. 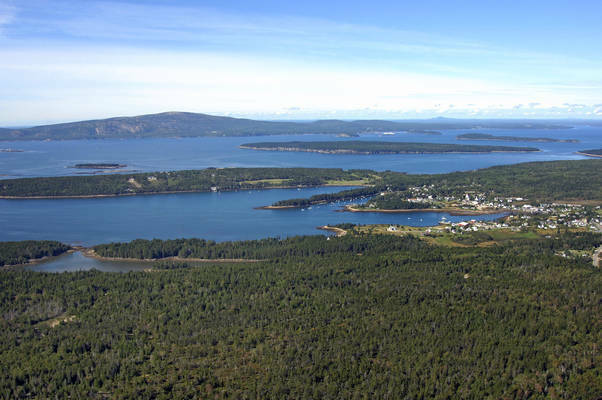 Grindstone Neck is the large forested piece of land to the left (west) just north of Ned and Mark islands. Inside Winter Harbor there are four marinas and marine facilities, but only one of them accepts transient guests (moorings only). If you need to fuel up with either gas or diesel fuel, the Winter Harbor Co-op was pumping both at the time of this writing. There are two other facilities in town, and among all four, you may be able to finagle your way into a place to tie up. Dont come to Winter Harbor expecting a dockside tie-up, however. Winter Harbor is typically approached from the south via a passage through the Atlantic opening of Frenchman Bay west of the Schoodic Peninsula. Alternatively, there is a northern passage off Frenchman Bay between a series of small islands just northwest of the main Winter Harbor opening. This passage is sparsely marked, but is generally deep, save for a narrow point at green daybeacon 3 northeast of Spectacle Island. Approaching from offshore, first set a course for flashing red (2+1), red and green (RACON) buoy FB, which is located at an approximate waypoint of N44 19.352 W068 07.400. Once you have safely navigated to flashing red (2+1), red and green (RACON) buoy FB, set a course of about 055 magnetic for approximately 3.1 miles to intercept flashing green, red and green buoy MI, which is visible in the image above just southeast of Mark Island. After you have cleared flashing green, red and green buoy MI by about .1 mile, set a new course of approximately 022 degrees magnetic for about one mile. This should put you between red nun buoy 2 and green can buoy 3. From here, you can head north into Henry Cove, making sure to to mind red nun buoy 4 marking the shoal at Guptill Point. Winter Harbor Marine is located here (moorings, repairs). Alternatively, from red nun buoy 2 and green can 3, you can head northwest toward red nun buoy 4 and red daybeacon to reach Inner Winter Harbor. The Winter Harbor Co-op is located here. 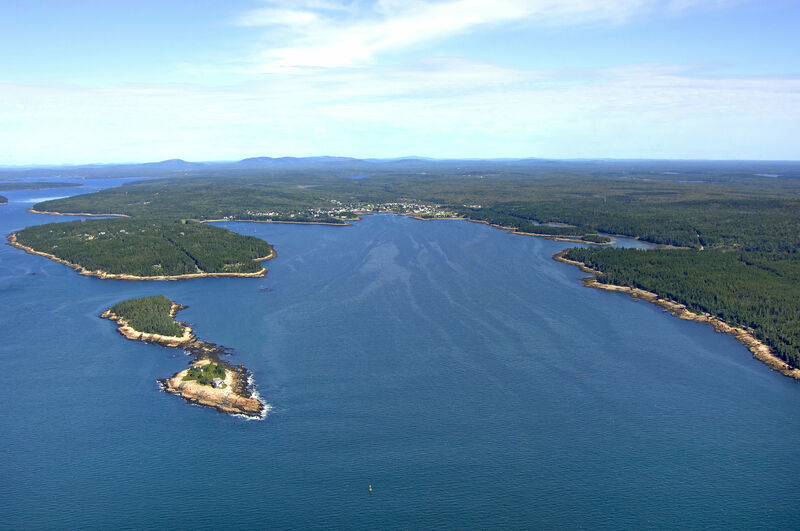 If you are looking for a place to drop the hook, Sand Cove is located just below and northwest of red nun buoy 2 and green can buoy 3 at Harbor Point. The second Saturday of every August, the Winter Harbor Lobster Festival draws a large crowd of spectators. It is a fun filled day with many scheduled events. Start off the day with a blueberry pancake breakfast, then watch the ever popular lobster boat races, with 13 classes rated by size and power, shop at the craft fair with 80+ exhibitors, eat a Maine lobster dinner and stay for the evening parade. Beginning in Winter Harbor, a free bus shuttle will provide you a tour of the Schoodic Section of Acadia National Park; the tour includes Gouldsboro's villages of Bunkers Harbor and Prospect Harbor before returning. A ferry runs from Winter Harbor on a regular schedule. See our Helpful Links section at the bottom of this page for a schedule. 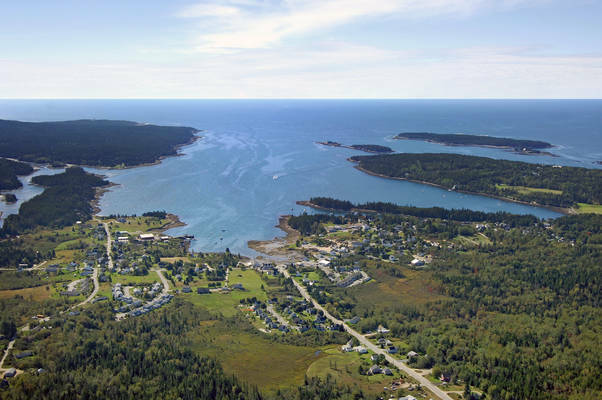 Most cruisers choose to explore Winter Harbor on foot or bicycle as there is no taxi service or public transportation available. No reviews yet! Be the first to write a review of Winter Harbor.